The DynamoDB Load component in Matillion ETL for Amazon Redshift allows you to load data into an existing Redshift table from objects stored in Amazon DynamoDB. This is similar to the S3 Load component, and also uses the Redshift COPY command. However, many of the COPY options are not applicable for a DynamoDB COPY, so this component is simpler to set up. The DynamoDB Load component in Matillion ETL for Amazon Redshift delivers fast data load performance and simple configuration, whilst being extensible to the most sophisticated data load and transform requirements. 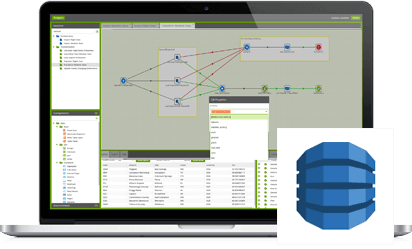 Want to try the DynamoDB Load component in Matillion ETL for Amazon Redshift? Arrange a free 1-hour demo, or start a free 14-day trial.